- Create a Mediterranean kitchen design using dark wood framed cabinets and a light marble countertop. Finish the look with an embossed concrete backsplashfeaturing a Mediterranean-inspired pattern. You can use embossing skins to add texture or stain to your backsplash for an artsy feel. 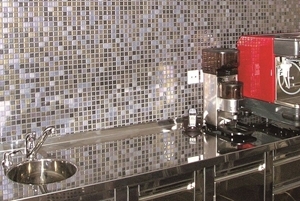 - Keep your modern kitchen design flowing with a stainless steel backsplash. The touch of shimmer looks extra sleek when paired with white frameless cabinets. Stainless steel is also eco-friendly and makes for easy cleanup - how could you go wrong with this dynamite material? - Use your backsplash to create more light. White onyx backsplash tiles with a mirror polish look like something you would find on a seashell. These tiles are the perfect accent for a bright, beach-inspired kitchen. The sparkly appearance helps magnify both natural and artificial light to keep the room light and cheery.